What about the real cost? In a typical scenario, when a company needs an enterprise-ready solution to fullfill its functional needs - does it make sense to go for a reactive application? But shouldn't we (in such case) just re-engineer the particular case towards asynchrony and event-driveness? Unfortunately (or fortunately) we can't and (what is more) we shouldn't - these are just different communication patterns and each of those has its use in different scenarios. But even if we can (in this particular case) refactor the application in that way - should we pursuit the opportunity? What's the additional cost and how does it compare to the potential benefits? If processing your event has failed, you don't know that immediately, so you need to set up a separate flow / procedure to deal with messages that caused trouble (for instance Dead Letter queues). If there's any response to be provided, both communication sides should have the receiving and dispatching logic implemented. In simple synchronuous scenarios server side implementation is trivial (unless you have to go full duplex which is quite rare). What's the purpose in having a responsible client if server has died anyway (for instance: all actors are overflooded with events they can't serve)? I mean - does it really make any difference? Modern day's computing power & I/O efficiency are that top notch that properly designed synchronuous OLTP will last milliseconds even under heavy load. Unless you're Twitter or Facebook - do you really need anything more than a load balancer and a farm of homogenous nodes with lightweight synchronuous services instances that use a shared DB? there's no real reason to go for the reactive approach. In theory, reactive approach is safer, more efficient, more scalable & may result in better user experience, but if you take under consideration all the 'mehs' above, can you really recommend an average enterprise that develops some applications for its own use to switch to reactive application style? Will Akka get a wider adoption? How will modern IDEs support reactive style of programming? 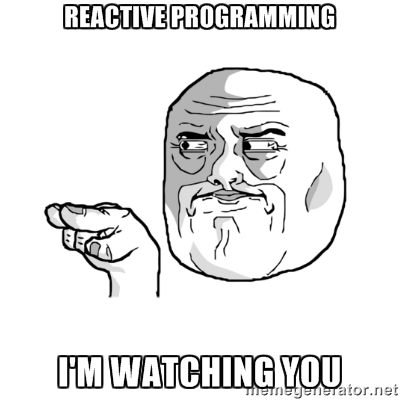 Will there be a new wave of reactive programming frameworks?